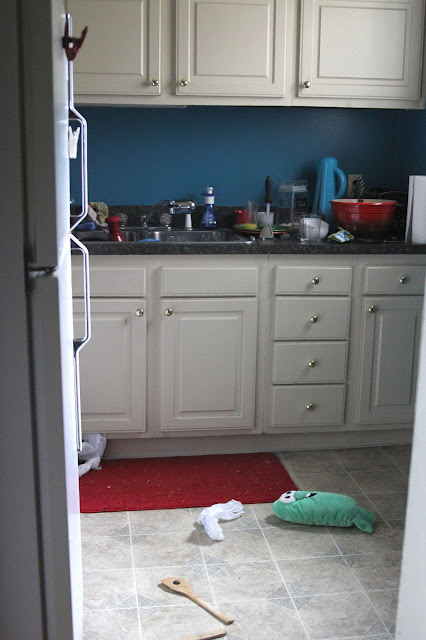 I've gotten fairly good at keeping our home in presentable condition most of the time, but do you ever notice how any time you let a few things slide, they all of a sudden snowball into one big overwhelming mess? Okay, it's really not that bad. It's not like Hoarders or CPS are going to be knocking down my door. Really, the kitchen is just a little messy and there's a nice mess of bits of bacon, homemade energy bar, and corn on the cob creating a fun texture on the floor conspicuously around where one adorable little boy sits at the table. My mom is going to be absolutely horrified that I am putting pictures of this on the internet. 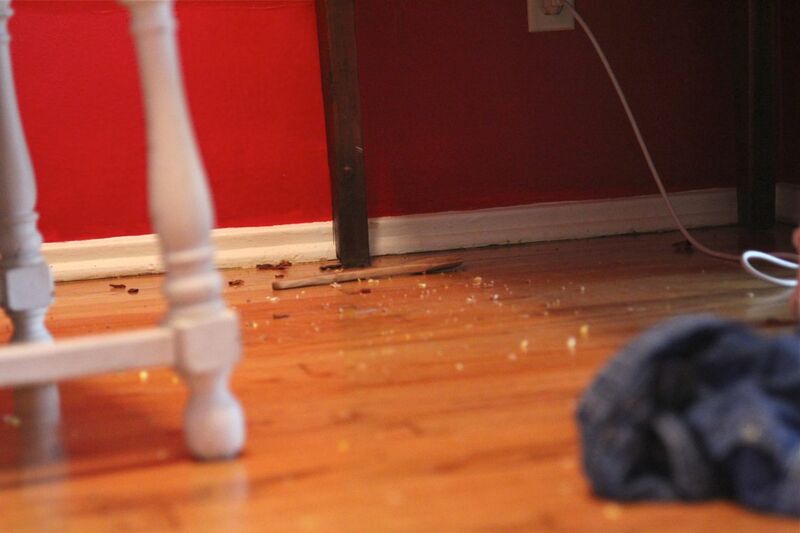 In case you're wondering, there are always wooden spoons laying randomly around our house because Jude likes to play with them like puppets, and you can see in the bottom right of the floor picture the pile of clothes that I stripped off of him after he finished eating the corn on the cob. And instead of cleaning any of it right now, before my hardworking husband comes home, I'm taking pictures of it and blogging about it. Insanity. A new friend brought her two boys over last week to play and kept commenting on how clean our apartment was. I don't think she reads my blog, but I wish she did so she could see that it's really not like that all of the time. I just wanted to encourage you today, just like I hope my blog encourages you every day, that it's okay to not be perfect. Yes, we are striving to glorify God in the way we order and keep our homes, but that doesn't mean we have to pretend to have it all together. What areas of your life might others think you have it all together, but you really don't? Or in what ways are you running yourself ragged trying to keep up with someone else's spotless home/well-behaved kids/perfect hair/ministry/etc.? How can we encourage each other to relax and just be ourselves? Oh boy, that sounds so familiar. We moved in nineteen days ago and we still don't have counters in our kitchen - and henceforth no sink and no dishwasher. Dishes stack up on my bathroom counter. I'm thankful we have two sinks - otherwise we wouldn't be able to brush our teeth! We cook at home every night because it's just so unhealthy and expensive to eat out. Plus we've been putting up fruit and veggies for the winter. It took a full hour to wash dishes last night. Prayers for you and your home. <3 That is encouraging. It's about what my house looks like right now. Like life happens here. Thanks for posting pictures to make us other messy moms feel less isolated (though your mess looks fairly clean to me...which tells you a lot about my mess). Anyone who knows me much has no illusions about my cleanliness (especially since our car is about as bad as our house...I am trying to improve though!). But people who don't live with me might be surprised to know I struggle with anger.